Auto Scheduler is based on the UK Auto Scheduler TAP, but is a port and heavy modification of this TAP to suit the new TMS machines. This TAP allows you to enter key words, it will regularly search the EPG, and create timers for you. If you set your searches up right, you may never need to set a timer again!! 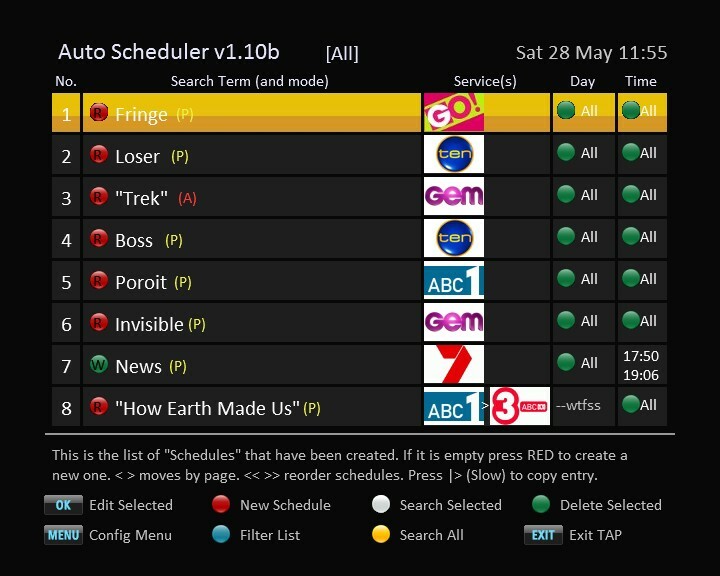 It really should run from AutoStart so it gets a chance to check your EPG every time you have the machine on. It is integrated with JustEPG as well. When you set a timer from JustEPG you can press the down-arrow when it asks you to confirm, and an option to send to UKAS will come up. Select this, and AutoScheduler will pickup the new search next time you bring up its menu. Once started, the default activation key is TeleText (box with lines in it), though this can be changed in the configuration menu. Due to the fact that they were implemented via firmware calls, the move to folder and keep functions of the original UKAS are no longer supported. AutoMove for TMS provides move functionality and works with this TAP without problems. The program is very much a companion program to TMSTimer by JaffaMan - the two share a lot of code and look and work in the same way, and make a good combination for timer setting and management.